1857 Groat Henry VII, facing bust, London mint, mint mark anchor 1499-1502. S.2199. Very fine. 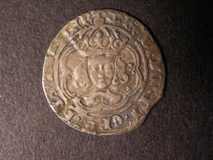 784 Groat Henry VII, facing bust, class IIIc, mint mark pansy. S.2199. Good fine.